On October 23, six months after the release of the first generation Black Shark, the new model named the Black Shark Helo arrived in Beijing, as scheduled. The Helo is divided into 3 versions, 6+128GB at a price tag of 3199 yuan ($461), the 8+128GB version priced at 3,499 yuan ($504), and the 10+256GB version priced at 4,199 yuan ($605). The Black Shark Helo sports a Qualcomm Snapdragon 845 processor, up to 10GB + 256GB memory options, front dual stereo speakers, immersive game space, RGB logo, and other luxury parameters. Thus, we are dealing with a true game smartphone that has real ambitions of becoming the best model in the niche. In fact, mobile games are becoming the next growth point in the smartphone industry. According to the ‘2017 China Game Industry Report’ published on the official website of the Game Industry Committee, the actual sales revenue of the Chinese game market in 2017 reached 203.31 billion yuan ($29.30 billion), of which the share of mobile games reached 57%, and the sales revenue reached 116.12 billion yuan ($16.74 billion). This is the first category in the game industry that broke through 100 billion. The data shows that the penetration rate of China’s mobile game app market reached 76.1% in 2017, and the user scale was 776 million. In other words, every six out of 10 are game players in China. Such a large player group and income scale is a huge growth potential market for the domestic smartphone market. This is why many smartphone manufacturers have launched a few models with mobile gaming in mind. This is undoubtedly one of the driving forces of the Black Shark to put forward the concept of the game smartphone, and the market has also proved the vision of the Black Shark. As a new brand, the Black Shark game smartphone has been quite eye-catching in this year’s 618. In 50 seconds, there were sold over 100,000 units. During the 618 period, the sales of Black Shark Technology broke 2 million, and it won the double sales of game smartphone category and overall sales. For a new brand, this performance has greatly exceeded people’s expectations, and it has changed people’s perception of the market classification of game phones. The mobile game players really need a professional-level e-sports equipment. We have already got the Black Shark Helo in advance. Compared with the first generation Black Shark game phone, it comes with many changes in appearance and not only. The phone’s package is black, carrying only the company’s S logo. The phone uses a customized dark theme. So the front panel looks astonishing. This screen is one of the most important features on the Black Shark Helo. The latter comes with a 6-inch Samsung AMOLED screen, sporting a resolution of 2160×1080 and supporting P3 wide color gamut and HDR. With Black Shark independent image processing chip, in theory, the AMOLED wide color gamut and high contrast ratio can be fully utilized. These are rare in other phones on the market. On the top, there is a very long speaker and earpiece design. 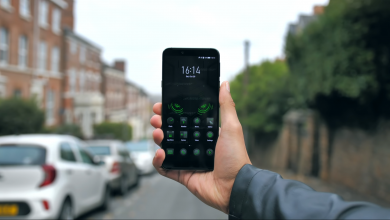 The Black Shark Helo does not use a notch screen design, but it is a traditional 18:9 full-screen. There is another long speaker on the lower area of the front panel. Thus, they provide a stereo audio experience. It is worth mentioning that the Black Shark Helo uses a dual super-linear SPK device to achieve a true stereo effect. The speaker on the front panel is not blocked by the hand when it is held in the landscape mode. It is also equipped with a dual smart PA, which brings a lower power consumption and smaller noise to Helo’s stereo speakers. The bottom of the Black Shark Helo is very simple, with only one center-mounted Type-C interface. On the left side of the fuselage, the power rocker and volume button are located. The slot has a long and narrow LED strip. On the right side of the fuselage, we can see the Shark button for the SIM card slot. It can be used to open Helo’s Shark mode – the high-performance full-blood mode that gamers love a lot. There is also an LED light strip on the right side. It comes with a dual Nano-SIM card slot and does not support memory card expansion. The back panel’s design differs from the first-gen mode a lot. The back of the first generation phone uses a stepped shape and an X design language. The entire back is patchy and highly recognizable, but it is also rough. The Black Shark Helo has inherited the X language design in general. But on this basis, it has been greatly simplified, and the sense of exquisiteness is born. First of all, the Black Shark Helo adopts the double material design of the metal middle frame + glass back plate. The matte metal material extends from the middle frame to the waistline on the back. At the same time, the waist back can also maximize the protection of the back glass. The center of the back is covered by a whole piece of glass backing, which is not only visually more concise but also the warm touch of the glass also greatly enhances the grip comfort. The back of the Black Shark Helo has a central axis symmetrical design. The flash, dual-camera and rear fingerprint holes are all on the central axis. In addition, the triangle texture of the first generation phone is also inherited. We are reviewing the 8+128GB variant, which comes with a black shark double-wing handle (left hand) in the box, with a special phone case as standard. Compared with the first generation controller, the Black Shark double-wing handle is more compact, and the up, down, left, and right buttons are added on the basis of the joystick. So they can cope with the operational requirements of no game. The bottom of the Black Shark’s two-wing handle is also charged using the Type-C interface. In addition, it can be seen from this angle that the Black Shark double-wing handle is not in the same plane as the smartphone, but is bent a little. This design allows the player to have a more prominent smartphone screen when holding the handle, and on the other hand, it is more suitable. It should be noted that the three versions of the Black Shark Helo handle accessories are not the same. The 6+128GB and 8+128GB versions are only equipped with a Black Shark double-wing handle, while the 10+256GB version comes with left and right-hand double handles. Black Shark Helo’s charging head supports 18W charging power output. We have chosen three large-scale mobile games to test the main feature of the Black Shark Helo. Among those games, we can mention Honor of Kings, PUBG, and Tekken 3. It is worth mentioning that the Black Shark Helo’s floating ball has a frame rate display function. So we will see the frame rate for each game. This is the most popular MOBA mobile game. We have opened the high frame rate mode in the game settings, multi-threaded optimization, high-definition picture quality, and the highest picture quality. It can be seen that the performance of the Black Shark Helo is very stable. The number of picture frames has been maintained at 60 frames. The CPU frequency has been maintained below 1.5GHz. The load is very low. PUBG is currently the most popular game, and it is also a large-scale mobile game with high requirements on smartphone hardware. We opened the HDR HD quality in the settings and the super-high frame number. In the test, the number of frames has been hovering between 39-40 frames, which is also quite stable. This is the most popular ACG mobile game in China. It has extremely abnormal requirements for smartphone hardware. The Android camp only has Snapdragon 845 to run smoothly. We opened the ultra-clear image quality and the full 60 frames. In this game, the performance of the Black Shark Helo is also very eye-catching. Although it has not been maintained at the highest frame, the total number of frames has remained above 55 frames. It can be seen that whether it is the Honor of Kings, PUBG or Crash 3, the Black Shark Helo can run smoothly at full frame or near full frame. The Black Shark Helo is equipped with a Qualcomm Snapdragon 845 SoC, 6GB, 8GB and 10GB memory, and runs on Joy based on Android 8.1. As you know, the Snapdragon 845 is Qualcomm’s flagship chip in 2018. It is based on the second-generation 10nm process. It uses Kryo 385 architecture, with a CPU clock speed of up to 2.8GHz. Apart from this, the CPU is paired with an Adreno 630 GPU, a dual-channel LPDDR4X memory, the peak download speed is 1.2Gbps, while the peak upload speed is 150Mbps. In AnTuTu, the Black Shark Helo scores 290,000 points. It is also the highest score of the current AnTuTu list. By the way, the Black Shark has long dominated this list. As for the GFXBecnh and Geekbench running points, they are also at the top level. It should be noted that PCMark’s running point is biased towards energy consumption. The Black Shark Helo’s PCMark score is 8508 points, ranking first in the list. The continuous reading speed is around 760MB/s, which corresponds to the standard USF2.1 performance. The Black Shark Helo’s screen supports the HDR standard. But the question is, how much benefit can HDR bring to mobile gamers? In order to answer this question, we need to understand the utility of HDR. In short, as a technical standard to improve the color level of the picture, the screen supporting HDR will display more colors than the general screen. Here we use Sony HDR 4K as a demo video to compare the differences between HDR screen and non-HDR screen displays. In the following photos, the Black Shark Helo is placed at the bottom. In this photo, the upper non-HDR screen display effect has been very bleak, and the Black Shark Helo’s screen is obviously more vivid. In this photo, the contrast is more obvious. The red color in the upper left corner is very bright on the Black Shark Helo, but the effect is not so prominent on the non-HDR screen. Obviously, the HDR screen can show more color details. In this photo, the performance of the Black Shark Helo is still very amazing, but the effect of the non-HDR screen is almost gray, and the contrast is quite obvious. This is the difference between an HDR screen and a non-HDR screen when playing HDR video. So what happens when you play the game? In this photo, we can see the color of the leaves that have the biggest difference between the two screens. The leaves of the non-HDR screen are yellowish in green, while the green leaf of the Black Shark Helo is very accurate. In this photo, the same situation occurs in the grass. The grass of the non-HDR screen is almost yellow, and in the screen of the Helo, the grass has returned to life. It can be seen that due to the HDR screen, the Black Shark Helo can display more color details on the screen, resulting in a better and more accurate display effect. The Black Shark Helo has designed a game dock bar for gamers, integrating some common functions into the dock bar and allowing players to adjust the phone settings without cutting out the screen. In the game, from the upper right corner of the screen to the diagonal line, you can call up the game dock. Players can choose the network, clean up the acceleration, switch the phone to reject, protect the eyes and other modes without jumping out of the game, and call up the handle. After opening the floating ball, a semi-transparent ball will appear on the game screen to display the number of game frames in real time. Clicking on the ball will also pop up hardware information such as CPU frequency and battery temperature. The Black Shark Helo is equipped with a 4000mAh battery. Due to it and the excellent power consumption of Qualcomm Snapdragon 845, it will have a very good battery life, which is very important especially for game players. We played an online video for 60 minutes. The volume was at 40%, the brightness at 50%, and the remaining power was 96%. After 60 minutes, the Black Shark Helo shows 86% remaining power. We played the PUBG for 60 minutes when the remaining power was 85%. After 60 minutes of the game, the Black Shark Helo showcases 65% remaining power. In other words, the Black Shark Helo consumes 10% of power for 1 hour of video playback and 20% for 1 hour of playing a game. Thus, you can continuously watch video for nearly 10 hours or play games for nearly 5 hours. The Black Shark Helo is also equipped with a liquid cooling system like its predecessor. But Helo has realized the sub-area and sub-module heat dissipation for the first time. It is also the first manufacturer to use dual heat pipe cooling. The luxurious cooling equipment brings a stronger heat transfer capacity and a wider heat dissipation path. The official heat transfer capacity of a single heat pipe is 5W, and the heat transfer capacity of the double heat pipe reaches 10W. We played the PUBG for half an hour to test the front and back temperatures of the Black Shark Helo. The first is the temperature on the front of the phone, at around 33 degrees. The middle part of the Black Shark Helo has a temperature of about 34 degrees. The highest temperature appears in the upper right corner of the back at 36 degrees. It can be seen that with the help of the dual-liquid cooling system, the heat dissipation efficiency of the Black Shark Helo is so high that the temperature of the whole machine is maintained at about 34 degrees, and the player can hardly feel it. The Black Shark Helo is equipped with 12MP + 20MP dual-camera. But Black Shark does not disclose the camera sensor model. We only know the main camera single pixel size of 1.25?m and the sub-pixel size is 1?m, but the pixel 4 Combined with 1. Considering that the Black Shark Helo is not a cameraphone, we will just provide some samples to show you its photography capabilities. There is also a 20MP front-facing camera supporting AI Beauty. As we said, the starting price of the Black Shark Helo is 3199 yuan. For the configuration of the Black Shark Helo, the price/performance ratio has exceeded the expectations of most people. We even don’t talk about the 10+256GB version, which sells for 4199 yuan. Do not forget we are dealing with the world’s first 10GB phone. Of course, the upcoming Xiaomi Mi MIX 3 will have a similar variant as well. But we guess this model will go on sale sooner. All in all, the Black Shark Helo is worthy of the name of ‘game phone’. Maybe it’s not that interesting or attractive to an average user, but if you are a real mobile gamer, this phone is one of the few professional-grade options at this price. if you still have the phone, can you please confirm if it has LTE Band 20 (800mhz)? Most of the gsmexperts and similar pages say it does, but aliexpress Mi Shop at product description doesn’t, I just don’t want to risk it as Band 20 covers pretty much all of our country.